- the only 8-year-old in the world to start a sentence with the words "Bearing in mind that ..."
- the teenage years: mind of a 40-year-old theologian, sense of humour that can only be described as clinically evil. - the minor contretemps of a few years ago that almost killed him. - and this weekend, a sword arch in a blizzard, upon the occasion of his marriage. As his father-in-law later remarked, it was the snow that drew everyone together. We went up a day earlier than planned with one eye on the weather. 2 hours on the M25: could have been a lot worse. Kings Langley is a pictureskew little place in Herts just off the motorway, where every flat surface has a building on it and the rest is all slopes. I should really have thought a little harder before choosing to park on the quite steep road where the church is, as the snow began to fall ... We got out eventually, but only by turning round and going deeper in to get out again further down the valley. And so it snew and snew. We were inside so didn't mind that much. The bride however was 40 minutes late, due to the hired Bentley not being able to get up one of those slopes to the house. (It was theorised she might have turned up but no one could see her against the backdrop: maybe the navy contingent could walk around a bit, and she might occlude one of them and become visible.) Eventually she walked from home, and they went away after in a Landrover. 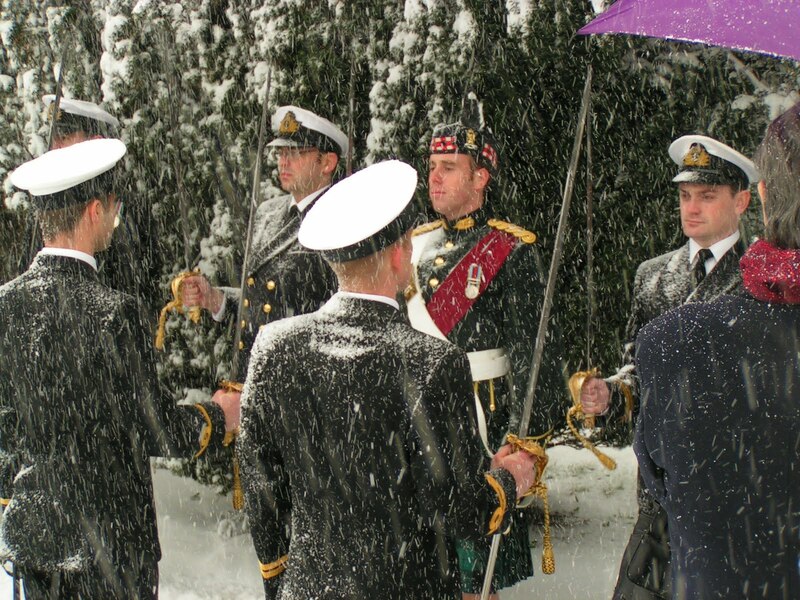 The sword arch were the icing on the icy cake: nine brave men standing at attention as the snow piled up on their heads and shoulders, slightly dreamy expressions suggesting that inwardly they were a long way away in a warm and happy place. But they snapped to attention at the right moment, and the newly wed couple walked through, and all was well. The couple were meant to be heading off on honeymoon to Brazil from Heathrow today. I don't think so. This car was completely snow free when I parked it, three hours earlier. 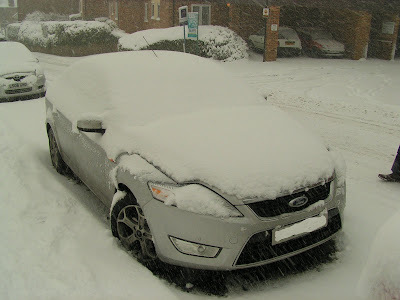 It got us there safely, and then up another of those slopes to the reception, and then back home again today at a sedate 50mph down a mostly empty, 2-lanes-mostly-clear M25 and M40. Shame it's only a hire car - looking forward with interest to seeing what the regular one can do for us next weekend.